← How do I create a link to a PDF e-Book? VeryPDF TIFF Toolkit recently has been updated to version 2.2, by the latest version, you can extract random page or pages from input tiff files and then merge extracted page into a new one. 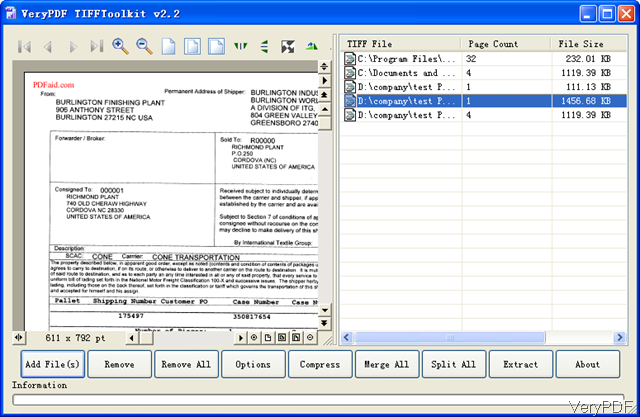 When you add tiff files to the latest version, all the pages and size will be shown in software interface. In the following part, I will show you how to make tiff merge work in batch by the latest version. As this software is GUI version, when downloading finishes, there will be an exe file in downloading folder. Please install this software by double clicking exe file. When installation finishes, there will be an icon on the desktop. Simply click the icon then you can launch this software. And even if we have updated this software but the price is still same $19.95 for whole life use. And this is Window application. now it can not work under Linux or Mac system. But if you need, we can customize one for you. The following snapshot is from the software interface, please have a check. In the left preview Windows, the added tiff file can be viewed. In the right file details part, detail information like file path, page count and file size will be shown clearly. Page count function is only available in the latest version. By this function, you do not even open tiff file then you can know how many page does it have. In the menu option, there is a new button added Extract. By this function, you can extract any page from tiff file and save it as a new one. And this function is also only available in the latest version. When you need to merge tiff files in batch, please add tiff files to software in batch by clicking button Add Files. Click button Merge All then there will be Save as dialogue box showing up where you can choose the output folder. A few seconds later, merged tiff file will show up in specified folder. Normally speaking, when merge tiff file, output PDF file size will be huge and it takes much space to be saved or transferred. By this software, you can compress merged tiff files in batch. But you can can do merge and compression together. When you finishes merging, click button Compress then you can compress tiff files directly. By this professional tiff file processing tool, you can do tiff merging in batch and count input tiff pages without opening it. During the using, if you have any question, please contact us as soon as possible. How to batch split PDF based on size? How to combine lots of TIFF files into one multi-page TIFF file? How to open and read a tiff image larger than 120MBytes using Image->FromFile in .NET C++? This entry was posted in TIFF Toolkit and tagged in batch, tiff merge. Bookmark the permalink.